Understandably there’s a great deal of discussion about Climategate 2 in the comments. I’m sure Robin will be along to give us his take but in the meantime here’s a thread dedicated to the subject. There’s a searchable database here (those with time might like to start sifting through the results for “BBC“). "The unbelieving… shall have their part in the lake which burneth with fire and brimstone"
Further to Robin’s post about Richard Black’s “nothing much to see here, move along now” article about the Climategate inquiries – I was amused to see that the BBC chose to highlight the significance of CRU data on climate models with a ludicrous alarmist image which appears to show bubbling oceans of lava. I tuned in very briefly this morning to Today and was taken aback by the gushing admiration that one of the BBC’s legion of eco-warrior reporters bestowed upon the speech at the Climatecon in Copenhagen by Hugo Chavez. It verged on hero-worship and shocked me because anyone who knows anything about this Venezuelan tyrant will know that he is an evil man, a thug, a clown. And yet, to at least one of our State Broadcaster reporters, he is man worth listening to. The BBC – still able to shock me. The Kate Silverton programme on Radio Five Live this morning dedicated a segment to telling us about all the wonderful positive things that will flow from the challenge of combating climate change (more recharging points for electric cars, refurbished homes, new factories, green jobs, a unicorn for every home, trees with money growing on them, that sort of thing). The guest they had on to help promote these lovely fluffy thoughts was none other than Solitaire Townsend, co-founder of Futerra Sustainability Communications, the PR agency behind the Rules of the Game propaganda document mentioned in the CRU emails. Of course none of that was brought up this morning (no talk of Climategate at all), nor was it pointed out that Futerra has advised the BBC on how to promote the eco agenda through workshops on “communicating sustainable development”. (An email promoting these Futerra workshops can be found in the CRU batch, coincidentally). It would appear that the latest element of the BBC/Futerra communications strategy is simply to let the green PR wonks have the airtime themselves to get their message across. The BBC investigation into the sabotage of an early morning 5 Live sports news bulletin with obscene material has concluded that chief suspect Ben Jacobs will not be offered any more freelance shifts. But the Beeb will be extremely careful with any statement for fear of legal action by Jacobs, who has kept silent since denying any involvement. He claims someone logged on to the BBC computer system in his name. Harrabin: media wrong, science not settled! Make sure you’re sitting down for this one. A frank admission from an unexpected quarter. The fallout from Climategate continues. 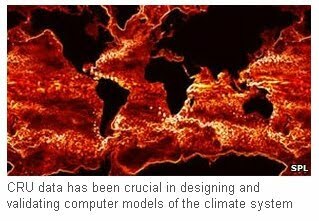 CLIMATEGATE – THE BBC SMOKING GUN? And in another post, Will S suggests that a FoI request is put in to the BBC to see what email exchanges there have been between Black, Harrabin et al and the CRU unit. An intersting idea. The Mann email clearly suggests much closer links than is normal between journalists and their sources – (to me) it sounds as though he knows Black will do his bidding. Is this the smoking gun showing that the BBC is in bed with the whole climate change scam? The BBC clearly thinks it has “done” the CRU scandal and is now carrying on as before, faithfully reporting the carefully orchestrated release of Copenhagen climate propaganda. Update 19.05: IPCC climatologist says Mann no longer credible, acknowledges career probably screwed for daring to say so.